Below you will find all the cheats of the game Regalia: Of Men and Monarchs for PS4 / XBOX ONE / SWITCH as well as video guides, solutions, strategies and tips. Welcome! Below we have collected the cheats of Regalia: Of Men and Monarchs, but not only, any Achievements, Codes and Trainer will be shown on this page if and when they are available. If you know others, suggest them by contacting us and we will be happy to publish them here on this article. Discover Cheats, Cheat Codes and Tricks for Regalia: Of Men and Monarchs (PS4 / XBOX ONE / SWITCH): Game Achievements Guide. We have material valid for PS4 / XBOX ONE / SWITCH The list of consoles is continuously updated from PS4 / XBOX ONE / SWITCH, the date on which Regalia: Of Men and Monarchs was published. Not only that, we can also offer you the solution of this game! 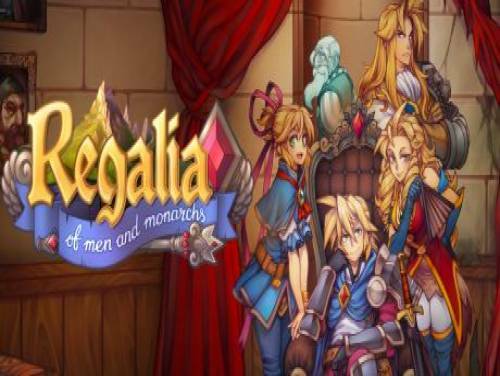 See the solution of Regalia: Of Men and Monarchs of apocanow, that is a selection of YouTube videos created specifically by third-party users in order to guide all the other players towards the completion of the game. complete Objectives and Trophies. At the bottom of the page you will also find a list of unlockable goals in this game with a small guide.The list is in English but we also have an automatically translated version to make it easier to understand. Regalia: Of Men And Monarchs is a tactical RPG set in a fantasy world full of oddities and wonders. Assemble your group, embark, managing your realm, make new friends and defeat your enemies in combat. Thank you for reading this short introduction. Let's go and show the cheats. Gold is more royal, but platinum will do. Lots of Speculation from Everyone! Complete the game. Thanks for playing! Max out Griffith's Personal Bond. Max out Signy's Personal Bond. Max out Aliss' Personal Bond. Max out Levant's Personal Bond. Max out Theo's Personal Bond. Max out Diego's Personal Bond. Max out Grenn's Personal Bond. Max out Esther's Personal Bond. Max out Henrietta's Personal Bond. Max out Valen's Personal Bond. Max out Mifune's Personal Bond. Max out Haksun's Personal Bond. Max out Baz and Lilka's Personal Bond. Max out Shichiroji's Personal Bond. Max out Gunther's Personal Bond. Max out Miri's Personal Bond. Max out Winter's Personal Bond. Max out Riehl's Personal Bond. Successfully placate the three feuding parties. Win the negotiations by exposing Bink. Win the negotiations by exposing Tag. Win the negotiations by eliminating both Tag and Bink. This Ain't Even a Lake! Fish out the legendary item. Vanquish the Visage of Anguish. Carry on the legacy of the fallen hero.